The war against deadly fire ants could be lost amid claims the $250 million program to eradicate the pest has been badly mismanaged. Kelmeny Fraser, David Murray The Sunday Mail (Qld) May 22, 2011. 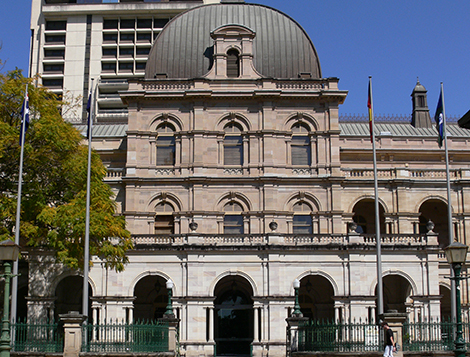 Scientists say mishandling of the program has sparked widespread “cynicism” about Queensland’s claim to have the problem under control. They are demanding an independent review before a national disaster develops. Efforts to wipe out the pest have descended into a blame game, with Queensland Agriculture Minister Tim Mulherin accusing the Federal Government of putting national biosecurity at risk through years of inadequate funding of the state’s eradication program. The State Government has warned the $15 million being injected into the problem each year might not be enough to stop the species invading other states and potentially causing billions of dollars damage to the national economy. “Queensland does not believe $15 million is sufficient to fund a fire-ant eradication program,” Mr Mulherin said. “We need a stronger ongoing funding commitment from all the states and the Commonwealth to continue the eradication program in Queensland so that we don’t see fire ants marching into NSW and Victoria,” he said. Federal Agriculture Minister Joe Ludwig said Canberra had provided half of the $245 million spent on the fire-ant program since 2001. “The Gillard Government takes any potential threat to Australia’s biosecurity seriously,” he said. Queensland receives $15 million a year under the national funding arrangement to combat fire ants, with the Bligh Government injecting an extra $6 million this year. The stoush has hit a crucial point following the discovery of hundreds of new infestations in Brisbane’s southwest since 2010. The meeting could determine the future direction and funding for the fire-ant program, with the group responsible for deciding the best combat method. A Campbell Newman-led LNP government has pledged an independent review of the program amid claims the Bligh Government has overstated its achievements. LNP agriculture spokesman Andrew Cripps said the government “does not appear to be making substantial headway”. “We definitely need to have a good solid look at why the response is not being effective,” he said. Former top government adviser on fire ants Pam Swepson, who became a whistleblower, said the country would pay the price for the government bungles and cover-ups. “We are yet ot have a death in Queensland but it’s just a matter of time,” she said. Dr Swepson said the extent of the fire-ant infestation in Queensland has been covered up to stop the Federal Government pulling funding. “While they (the State Government) were continuing to call it an eradication program, even though it was extremely compromised and there’s no chance we can eradicate it any more, the funding kept coming which wiould give them reason to under-report,” she said. Experts in the US, where people die from fire-ant stings every year, say the state has little chance of eradication. Fire-ant expert Dr Bart Drees, from Texas, where $US1.2 billion ($1.1 billion) as year is spent on containing fire ants, said eradication had not been achieve anywhere, and University of NSW entomologist Dr Chris Orton has called for an independent assessment of claimed successes. Biosecurity Queensland fire-ant eradication program deputy director Craig Jennings insisted Queensland could still wipe out the pest. An estimated 65,000 colonies were detected when fire ants were first found in 2001, but last year that was down to about 500 colonies. Mr Jennings said the strategy could now shift from large-scale treatments to surveillance and more targeted treatments. The number of fire-ant staff has grown from 100 workers five years ago to 190 staff less than half the number on the program in 2001. Acacia Ridge, Alberton, Alexandra Hills, Algester, Amberley, Annerley, Anstead, Archerfield, Ascot, Ashwell, Auchenflower, Augustine Heights, Bahrs Scrub, Balmoral, Banyo, Barellan Point, Basin Pocket, Beenleigh, Bellbird Park, Bellbowrie, Belmont, Berrinba, Bethania, Birkdale, Blackstone, Boondal, Boronia Heights, Brassall, Brookfield, Brookwater, Browns Plains, Buccan, Bundamba, Burbank, Calamvale, Calvert, Camira, Cannon Hill, Capalaba, Carbrook, Carina Heights, Carindale, Carole Park, Chandler, Churchill, Clayfield, Cleveland, Collingwood Park, Coopers Plains, Coorparoo, Corinda, Cornubia, Crestmead, Daisy Hill, Darra, Deebing Heights, Dinmore, Doolandella, Drewvale, Durack, Eagle Farm, Eagleby, East Brisbane, East Ipswich, Eastern Heights, Ebbw Vale, Evenezer, Edens Landing, Eight Mile Plains, Ellen Grove, Fairfield, Fig Tree Pocket, Flinders View, Forest Lake, Forestdale, Gailes, Goodna, Goolman, Graceville, Grandchester, Greenbank, Greenslopes, Gumdale, Harrisville, Heathwood, Hemmant, Hendra, Heritage Park, Hillcrest, Holland Park, Holland Park West, Holmview, Inala, Ipswich, Jamboree Heights, Jeebropilly, Jindalee, Karalee, Karawatha, Karrabin, Kenmore, Kenmore Hills, Kingston, Kuraby, Lanefield, Larapinta, Leichhardt, Logan Central, Logan Reserve, Loganholme, Loganlea, Lower Mount Walker, Lyons, Lytton, Macgregor, Mackenzie, Manly West, Mansfield, Marsden, Meadowbrook, Middle Park, Milora, Moggill, Moores Pocket, Moorooka, Morningside, Mount Coot-tha, Mount Cotton, Mount Forbes, Mount Gravatt, Mount Gravatt East, Mount Morrow, Mount Mort, Mount Ommaney, Munruben, Murarrie, Mutdapilly, Nathan, New Beith, New Chum, Newtown, North Booval, North Ipswich, North Maclean, Northgate, Nudgee, Nudgee Beach, Nundah, One Mile, Orminston, Oxley, Pallara, Park Ridge, Park Ridge South, Parkinson, Peak Crossing, Pinjarra Hills, Pinkenba, Port of Brisbane, Priestdale, Pullenvale, Purga, Raceview, Redbank, Redbank Plains, Redland Bay, Regents Park, Richlands, Ripley, Riverhills, Riverview, Robertson, Rochedale, Rochedale South, Rocklea, Rosewood, Runcorn, Sadliers Crossing, Salisbury, Seventeen Mile Rocks, Shailer Park, Sheldon, Silkstone, Sinnamon Park, Slacks Creek, South Ripley, Spring Mountain, Springfield, Springfield Central, Springfield Lakes, Springwood, Stretton, Sumner, Sunnybank, Sunnybank Hills, Swanbank, Tanah Merah, Tarragindi, Tennyson, Thagoonda, Thornlands, Tingalpa, Tivoli, Toowong, Underwood, Upper Brookfield, Upper Mount Gravatt, Victoria Point, Virginia, Wacol, Walloon, Washpool, Waterford, Waterford West, Wellington Point, West End, West Ipswich, Westlake, White Rock, Willawong, Willowbank, Wilsons Plains, Wishart, Woodridge, Woolloongabba, Wulkuraka, Wynnum, Wynnum West, Yamanto, Yeeroonpilly, Yeronga. Suburbs where fire ants have been detected since 2010. Algester, Ashwell, Augustine, Bellbird Park, Belmont, Berrinba, Boronia Heights, Brookwater, Browns Plains, Bundamba, Burbank, Calamvale, Carindale, Churchill, Crestmead, Darra, Deebing Heights, Doolandella, Drewvale, Durack, Ebenezer, Eight Mile Plains, Ellen Grove, Flinders View, Forest Lake, Forestdale, Gailes, Goodna, Greenbank, Harrisville, Heathwood, Heritage Park, Hillcrest, Holmview, Inala, Kingston, Kuraby, Lanefield, Larapinta, Leichhardt, Logan Reserve, Loganholme, Mackenzie, Mansfield, Marburg, Mount Cotton, Mt Marrow, Mt Mort, Mt Walker, Munruben, Mutdapilly, New Beith, North Booval, North Ipswich, One Mile, Ormeau, Oxley, Pallara, Park Ridge, Park Ridge South, Parkinson, Peak Crossing, Pine Mountain, Purga, Raceview, Redbank, Redbank Plains, Regents Park, Richlands, Ripley, Rochedale, Rosewood, Runcorn, Seventeen Mile Rocks, Sheldon, Spring Mountain, Springfield Central, Springfield Lakes, Stretton, Sunnybank, Sunnybank Hills, Tallegalla, Thagoona, Tingalpa, Underwood, Walloon, Washpool, Waterford, Waterford West, White Rock, Willawong, Willowbank, Wulkuraka, Yamanto.